The 3rd and 4th of October marked the celebrations of the Yewish New Year. In the occupied West Bank, Jewish holidays, celebrated by the settlers from the illegal settlements. This usually translates to an increase in harassment, restrictions and the presence of heavily-armed military occupying forces and settlers, often not only from the illegal settlements of the respective cities, but additionally ‘settler-visitors’. In occupied al-Khalil (Hebron), with the celebrations for the New Year now past, preparations for the upcoming week-long holiday of Sukkot are already underway. During the two-day celebration of the Yewish New Year, the part of Ibrahimi Mosque that has not been confiscated by the Israeli forces has been closed entirely for Palestinians and Muslims. Sixty percent of the Mosque was illegally annexed by Israeli forces who installed a synagogue inside in the aftermath of the1994 Ibrahimi Mosque massacre. Additionally, the nearby Ibrahimi Mosque checkpoint that connects the new Palestinian market (after the closure and ethnic cleansing of Shuhada Street, the former bustling Palestinian market, in the aftermath of the Ibrahimi mosque massacre) with the Ibrahimi Mosque area has been closed for Palestinians since Sunday night. 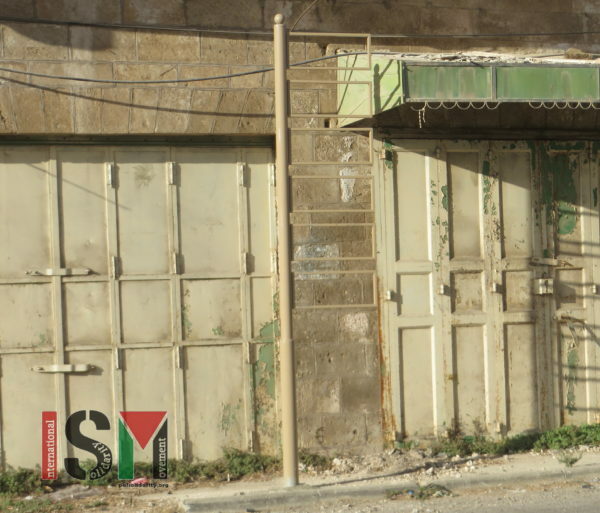 This leaves Palestinians, including residents, school-students and teachers with only few options to reach school, work and their homes, as the closest alternative of Shuhada Street is ‘illegal’ to use for Palestinians under Israeli occupation ‘rules’. On Thursday, October 6th, both the Mosque and the nearby checkpoint were closed as well – even though there’s no official Yewish holiday; yet another arbitrary movement restriction on Palestinians in order to favour settlers. These movement restrictions, which are solely and deliberately only enforced on Palestinians, have directly impeded the right to education in various areas. 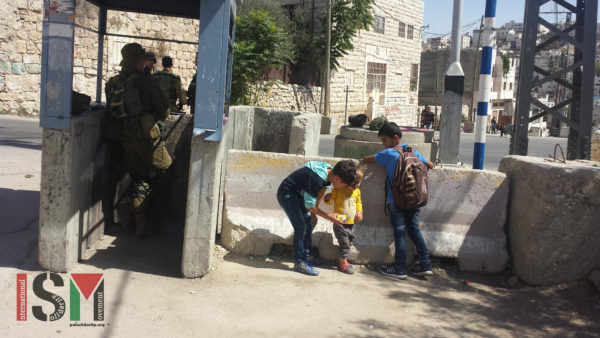 At Ziad Jaber school near the illegal settlement of Kiryat Arba, school-students, their parents walking them to school and teachers had to cross paths with the heavily-armed settlers, and often undergo bag-, ID- and body-searches based on racial profiling by the Israeli forces. Young adult men are especially targeted by these arbitrary and often humiliating searches, where they are forced to lift up their shirts and trouser-legs, basically getting half-undressed in public. A similar procedure is enforced on Palestinians when Israeli settlers from the illegal Kiryat Arba settlement walk down to Ibrahimi Mosque (the 60% of it where a synagogue was installed) in the evenings. As any Friday night, where the settlers have the same ritual for Shabbat, Palestinians are oftentimes stopped by Israeli forces who completely line the roads the settlers will be taking, in order to allow for settlers to pass the street before allowing Palestinians to continue their way. Often, Israeli forces stop especially young men and force them to undergo similar checks, ordering them to lift up their shirts and turn around, and then lift up their trouser legs. 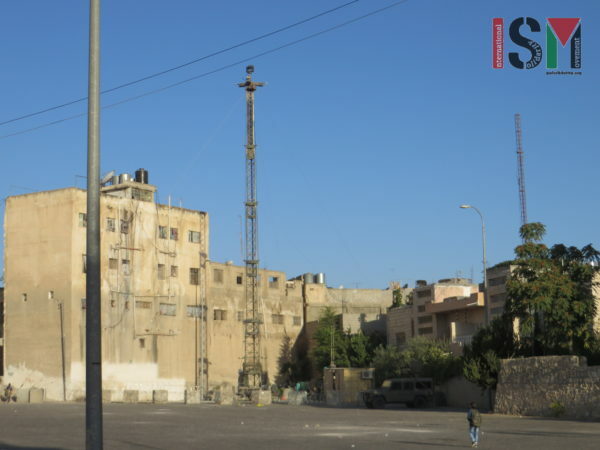 Opposite the al-Faihaa girls school in the Ibrahimi Mosque area, Israeli forces put up an additional CCTV surveillance tower, registering and locking Palestinians’ every movement. The structure is fenced off with concrete blocks and barbed wire, and always manned with at least two soldiers. For the upcoming holiday of Sukkot, where many settlers from the illegal settlements all over the Israeli occupied West Bank are expected to visit the Ibrahimi Mosque (the 60% of it where a synagogue has been installed), preparations in al-Khalil are under way for making the area as empty as possible of any Palestinian presence. New sign-posts are being put up to indicate directions for the ‘visitors’. Changing and ‘Hebrew-nising’ street names, giving Hebrew names to houses illegaly taken over by settlers, etc. has already been identified as one of the tools of the Israeli occupation to lay claim to Palestinian property and streets – an obvious attempt to erase the Palestinian existence in the mind of the people first. At the same time, ethnic cleansing is slowly but steadily taking place, especially in the Old City of al-Khalil.